OK…here’s a question for you! How many eggs do you add to your meatballs?! There is nothing worse that a dry meatball! Try adding an extra egg to the next recipe you try and see if it makes a difference in how moist and delicious they turn out. I’ve noticed a big difference since adding 2 eggs to my meatballs, as opposed to 1 egg. 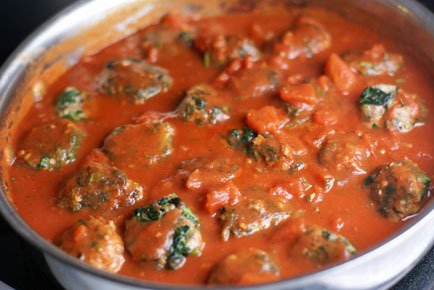 Do tell – What is your favorite way to make meatballs?! Feel free to leave your recipe in the comments or Linky. Chicken meatballs to be added to Italian Wedding Soup. Use this recipe: http://www.foodnetwork.com/recipes/giada-de-laurentiis/italian-wedding-soup-recipe/index.html for the meatballs and substitute ground chicken for the other meats. I have a recipe for meatballs and tomato sauce that I made the wrong way the first time I made them. The recipe said to make the meatballs, brown them, then add 1/4 cup of red wine to the pan to deglaze it. I didn’t read the directions but stirred the wine into the meatball mixture. They were so moist and delicious! I’ve made them that way ever since. I started subbing oatmeal for the bread crumbs in my meatball recipes when we thought our youngest had a wheat allergy. They turn out super moist. The allergy days are behind us, but I’ll never go back!